MMIC- technology (Monolithic Microwave Integrated Circuit) is a semiconductor process technology. It can be used to obtain active elements on the same silicon substrate. These circuits can be used up to very high frequencies. GaAs-MESFETs are more often used by radar sets in solid state high power amplifiers. Silicium- bipolar and CMOS <6 GHz Very mature, commercially available, good CAD support. BJT: high amplifications, small tolerances, Silicium substratum: dielectric with high losses. Very high mask costs for custom-designed MMICs. Suitable for mixedly analog/digital wirings. Silicium-Germanium- bipolar (Si-Ge) <10 GHz In short time on high level developed. CAD support is under construction. Very complex and expensive process. Suitable for mixedly analog/digital wirings. GaAs-MESFET <10 GHz Mature, commercial well available for custom-designed MMICs. Good CAD support. Simple technology: economical for custom-designed wirings with small quantities. Suitable for high power amplifiers. 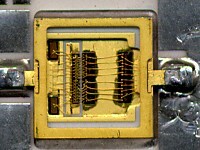 GaAs-hetero-bipolar transistors (HBT) <20 GHz In commercial introduction. CAD support is under construction. Suitable for fastest digital circuits, oscillators and power amplifiers. Indium-phosphid- HEMT (InP) <100 GHz In commercial introduction. CAD support is under construction. InP-HEMT: best microwave qualities for small signals and low noise. Indium-phosphid-HBT (InP) <230 GHz In commercial introduction. Suitable for fastest digital circuits.